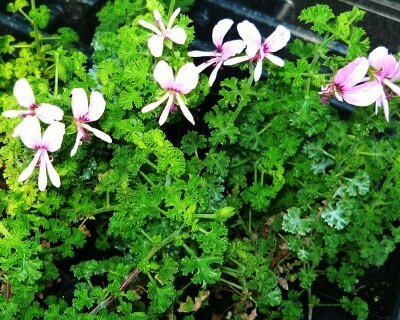 Fingerbowl Lemon Scented Geranium - Small crinkly green leaves have a strong lemon scent. Upright compact and stiff growth habit and pretty pink flowers when in bloom. Makes a nice container plant. Leaves were used during Victorian times in ladies "fingerbowls". Perennial zones 10 - 11+ Live starter plant in 3 inch container.